Historic IWM Duxford remains a working airfield to this day. During operating hours, a small team of professional air traffic controllers working from the Second World War control tower provides a Flight Information Service to IWM Duxford-based aircraft. It’s a great place to learn with long grass and tarmac runways, a great easy to find location and a wealth of aviation history. Position: 52° 05.07'N, 000° 07.55'E (7 nm south of Cambridge). IWM Duxford’s airfield is strictly PPR by telephone 01223 833376 during operating hours. Non-radio aircraft not accepted, but in exceptional circumstances strictly PPR. Summer: mid March to mid October, 10.00am to 6.00pm local time. Last aircraft must be airborne by 5.45pm local time. Winter: mid October to mid March, 10.00am to 4.00pm local time. Last aircraft must be airborne by 3.45pm local time. For actual dates see our opening times [Link to IWMD Visitor Info]. Great facilities including restaurants, cafes, gift shops, children’s playground, plenty of parking, Pilots’ briefing room, and of course over 85 acres of historic aircraft and military exhibitions. 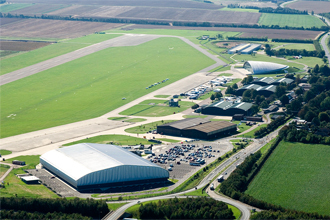 The Airfield is located 8 miles south of Cambridge. For SatNav use the postcode CB22 4QR. There is a British Rail station at Cambridge and Whittlesford nearby but you would need a taxi from the station to the airfield. Discounted accommodation rates available from the Holiday Inn Express Duxford for CWFT customers.